All the heavy work has been done. Volunteers are invited to help pull the new weeds. As part of a citywide effort to restore natural habitats in our local parks, neighbors are invited to help maintain recently restored areas in Twin Ponds Park, southern end, on Saturday, September 22 from 10:00am to 1:00pm. For over a year we have worked to remove invasive weeds and add native plantings along Thornton Creek where it crosses under First Ave. People enjoying the park are very complimentary about the impact on the environment made by neighbors joining together. 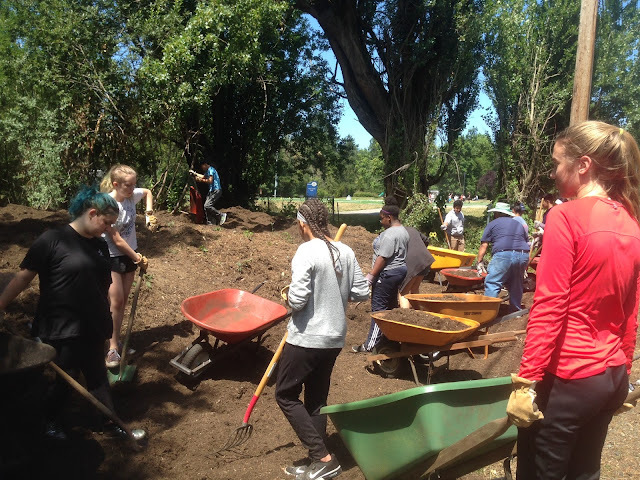 Our park staff and city budget aren’t sufficient to do this work without your help. More citizens are needed to keep the new shrubs and trees free of the weeds which return for several years in any restoration site. Eventually the new plantings will grow and thrive and the retuning weeds will be outnumbered. We should never see the masses of vines shrouding every other living thing again. This is a great activity for families with teens completing service hours for credit toward high school graduation. Youth groups are also welcome. Please dress for rain and cooler fall weather, and wear sturdy work shoes. We will supply tools, gloves and a large jug of water. Or bring your own things including a snack if you like. No special skills needed as we will teach you what you need to know. This year a small committee of volunteers will meet for an hour or two on Tuesdays to help with upkeep. If this weekly time is better for you, please contact us. This is a great way to make new friends.